Video clip synopsis – On January 26, 1788 the British arrived at what is now known as Sydney, New South Wales, with the intention of taking possession of the land in the name of the British Government and the King, and of staying. Broadband MP4 aboriginalnsw_bb.mp4 (2.4MB), suitable for iPods and computer downloads. Aboriginal people and the colony of NSW is an excerpt from the documentary Rites of Passage the second episode of the two-part series entitled Rogue Nation, produced in 2009. Historian Michael Cathcart tells the epic story of how the colourful characters of early colonial Australia transformed a penal settlement into a land with rights and opportunity in a mere 40 years. This sweeping two-part dramatised documentary covers formative events in Australia’s history, including the Rum Rebellion and early court cases, which established independence and civil rights for all settlers. Rogue Nation explores how a fledgling colony on the wrong side of the globe was rapidly transformed from a place of punishment to a place of opportunity; a confident and prosperous community. It goes behind the power struggles between wealthy landowners, the educated offspring of convict settlers and the governors who ran the colony. A Screen Australia production in association with Essential Media & Entertainment. Images in the clip courtesy of the Dixson Galleries and Mitchell Library, State Library of New South Wales. January 26, 1788 was an important day in Australia’s long and ancient history. It was the day on which the British arrived at what is now known as Sydney, New South Wales, with the intention of taking possession of the land in the name of the British Government and the King, and of remaining. Although there were other reasons, the new British colony was essentially meant to be a jail for transported convicts, organised to relieve the badly overcrowded prison system in England. Australia was considered not to be inhabited by peoples who had a comparable, similar or even an identifiable form of civilisation, government or nationhood. From the British viewpoint there was no observable, organised, coherent, structured society of rules, laws and heritage similar to their own. Aboriginal society was confusing, and little effort was made to comprehend it, especially in far away England. There was no written indigenous language, and therefore no written records, no deeds of ownership upon which European society was based. To the British the land was considered empty of human civilisation. It was terra nullius. The land was fenced. Towns were built. European settlers spread out from Sydney, forcing the indigenous people further away, leading to violence and reprisals. Along with social dislocation, European settlement also brought the horror and despair of massive deaths caused by disease epidemics. Students can work in a variety of ways – individually, in small groups, and as a class to investigate, respond to and discuss the questions and points that follow. Introduce or revisit the concept of a ‘primary’ source and a ‘secondary’ source of historical information. What are primary sources? What can we learn about the lives of aboriginal people in colony of NSW at this time from these historic drawing? What can you see in the details? Why is it important to use original records or documents created by someone who lived at the time of the event? For more information go the State Library of NSW Macquarie Era website (URL below) and look carefully at the online panorama of Sydney drawn by Major James Taylor which shows the town of Sydney as it looked in 1821. Use the scroll and magnification tools to look at the whole picture which includes aboriginal people on the fringes. Seeing the scene in this wider context, what else does it tell you about the lives of the indigenous people? What are some of the problems identified by the narrator for the aborigines at this time? Look at the drawing which is on the screen when the narrator is describing the impact of the disease smallpox on the aboriginal population. What can you see here? Find out more about smallpox. 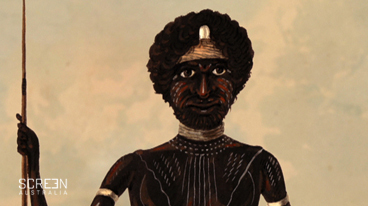 Why was smallpox such a terrible disease for the Australian aborigines? The narrator also says that the aboriginal people’ …still hunt and fish but white man’s bread and grog are winning out.’ Discuss this statement and what it means. Find out more about the impact of the colony on the lives of the local inhabitants. Research the lifestyle of aboriginal people in Australia in the time before the first colony was established by the English in New South Wales. Compile your data into a presentation. Imagine you are a local aborigine in 1819. Create a response describing your life story and how your life has changed with the coming of the Europeans. Describe what you think about this situation. How would you feel about this and the changes to your life? This could be written or presented as a role play, song or in a multimedia format.